Cosimo III de' Medici (14 August 1642 – 31 October 1723) was the penultimate Grand Duke of Tuscany. 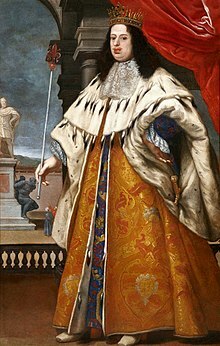 He reigned from 1670 to 1723, and was the elder son of Grand Duke Ferdinando II of Tuscany. Cosimo's fifty long reign, the longest in Tuscan history, was marked by a series of regulatory laws. His reign also saw Tuscany's bad finances become even worse. He was succeeded by his elder surviving son, Gian Gastone de' Medici, when he died, in 1723. He married Marguerite Louise d'Orléans, a cousin of Louis XIV. It was a bad marriage and Marguerite Louise eventually left Tuscany to remain at the Convent of Montmartre in Paris. Together, they had 3 children. In later life, he tried to have Anna Maria Luisa recognised as heiress of Tuscany, but Charles VI, Holy Roman Emperor, would not allow it. Tuscany passed it to the House of Lorraine in 1737. Cosimo III's official style was "Cosimo the Third, By the Grace of God, Grand Duke of Tuscany." This page was last changed on 25 May 2017, at 02:55.